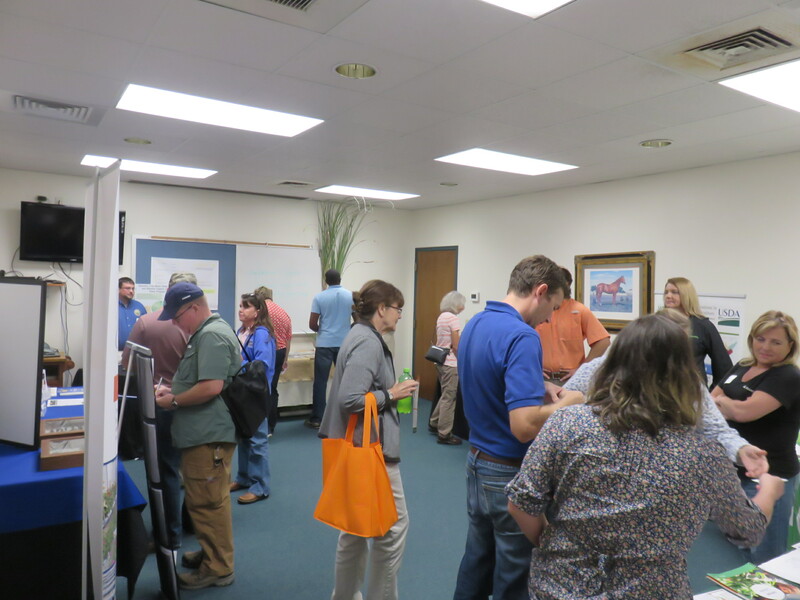 The Panhandle Ag Extension Team hosted the inaugural Panhandle Fruit & Vegetable Conference on Tuesday, October 11. 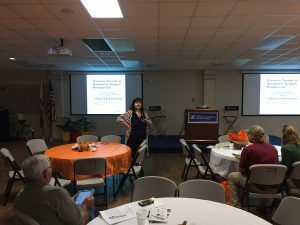 The conference featured three concurrent session tracks for participants to choose from, a keynote address on whole farm business profitability, and a locally sourced lunch cooked by the Jackson County Master Gardeners. More than 120 people attended the conference. Participants of the Panhandle Fruit & Vegetable Conference enjoying the trade show. Photo Credit: Doug Mayo, UF/IFAS Extension. The conference was sponsored by 18 different businesses and organizations. 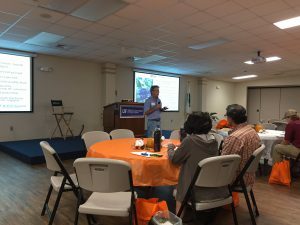 A Florida Department of Agriculture and Consumer Services Specialty Crop Block Grant provided funding for the educational resources for the conference. Dr. Pete Vergot welcomes attendees to the Panhandle Fruit & Vegetable Conference. Photo Credit: Libbie Johnson, UF/IFAS Extension. Dr. Pete Vergot, Northwest District Extension Director, welcomed attendees to the Panhandle Fruit & Vegetable Conference by sharing his first-hand experiences about growing up on a vegetable farm in Michigan. 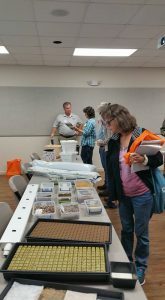 Extension Agent Bob Hochmuth reviewed various hydroponic media during a Protected Ag session at the Panhandle Fruit & Vegetable Conference. Photo Credit: Libbie Johnson, UF/IFAS Extension. The Protected Agriculture sessions were organized by Leon County Extension Agent Molly Jameson. 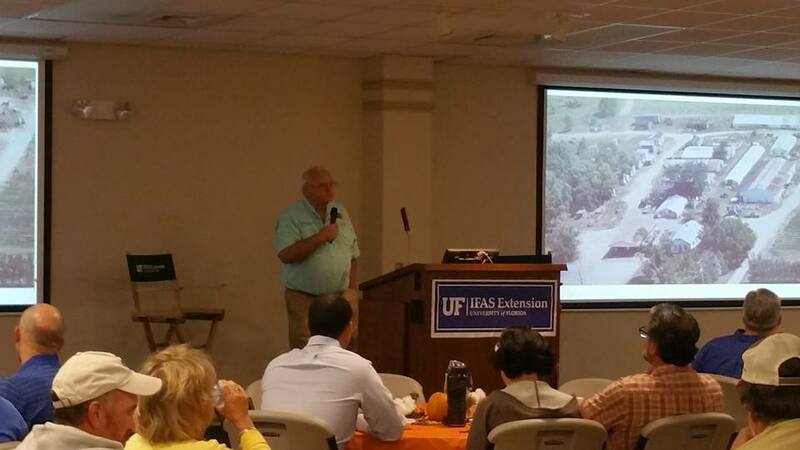 Bob Hochmuth, UF/IFAS Regional Extension Agent is a vegetable production specialist. He spoke to participants about different hydroponic production systems and about fertilizer management. 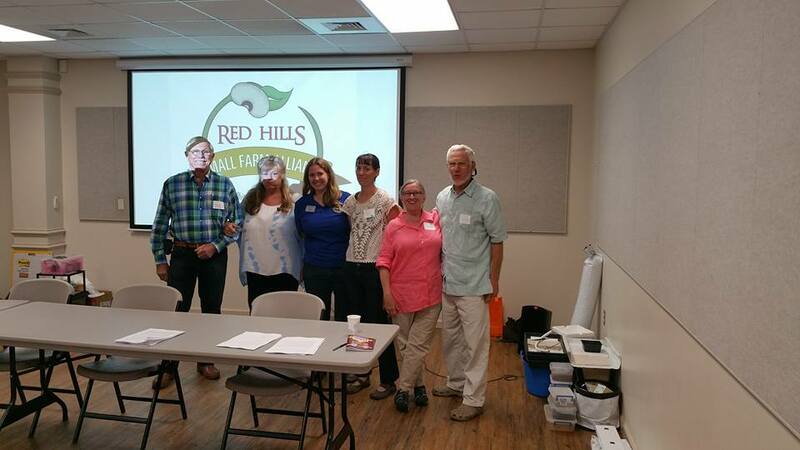 Members of the Red Hills Small Farm Alliance presented during a Protected Agriculture session at the Panhandle Fruit & Vegetable Conference. Photo Credit: Libbie Johnson, UF/IFAS Extension. Tallahassee’s Red Hills Small Farm Alliance members Herman Holley, Katie Harris, and Wayne Hawthorne discussed their farming and marketing experiences with attendees at one of the Protected Agriculture sessions. The Red Hills Small Farm Alliance is a 501c3 non-profit organization that assists small farms in the Red Hills Region with production and marketing. Dr. Jeff Williamson presenting on blueberry varieties and production at the Panhandle Fruit & Vegetable Conference. Photo Credit: Matt Orwat, UF/IFAS Extension. The Fruit & Berry sessions were organized by Washington County Extension Agent Matt Orwat. UF/IFAS Blueberry Specialist Dr. Jeff Williamson talked to participants about blueberry production practices and blueberry varieties. Dr. Violeta Tsolova presenting about grape varieties at the Panhandle Fruit & Vegetable Conference. Photo Credit: Matt Orwat, UF/IFAS Extension. Dr. Violeta Tsolova gave participants an in-depth review of grape varieties suitable for North Florida. Dr. Tsolova is a Viticulture Specialist at Florida A&M University. Dr. Ayanava Majumdar presenting at the Panhandle Fruit & Vegetable Conference. 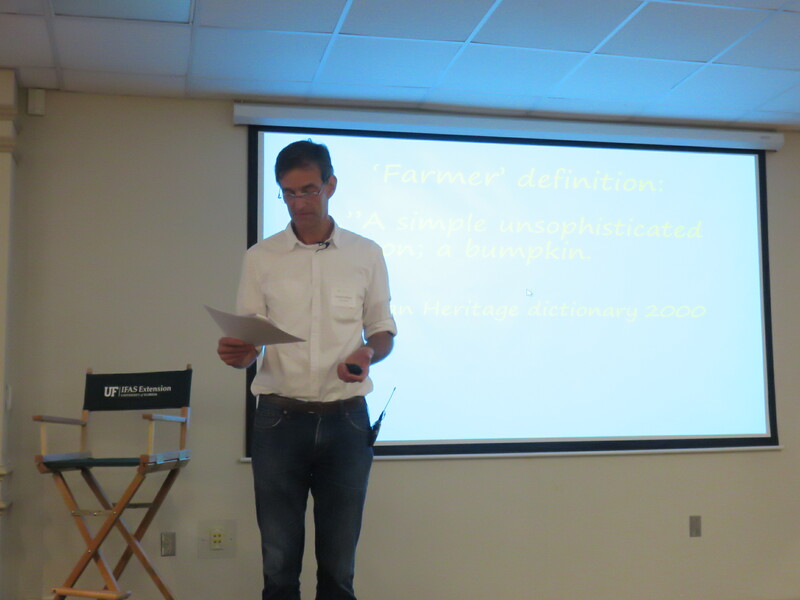 The Diversified Agriculture sessions were organized by Dr. Josh Freeman. 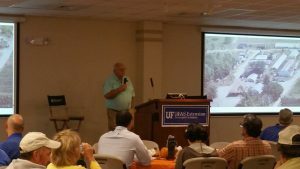 Dr. Freeman is the UF/IFAS Vegetable Specialist housed at the University of Florida’s North Florida Research & Education Center in Quincy, FL. During one of the Diversified Agriculture sessions, Dr. Ayanava Majumdar, from Auburn University, taught participants about various Integrated Pest Management strategies for insect management in vegetable crops. 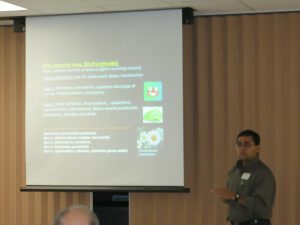 Dr. Majumdar also presented in one of the Protected Agriculture sessions. 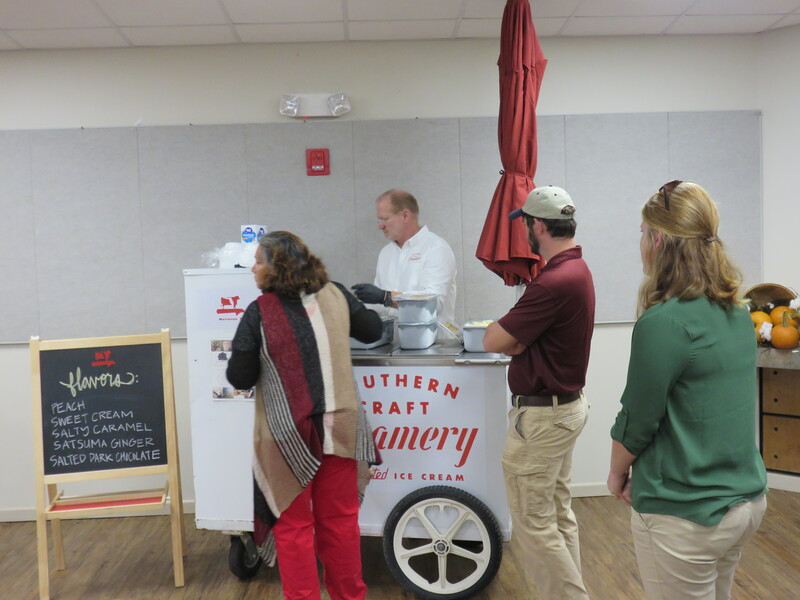 Participants lining up for Southern Craft Creamery ice cream at the Panhandle Fruit & Vegetable Conference. Photo Credit: Doug Mayo, UF/IFAS Extension. After the morning sessions were complete, the attendees of the conference were treated to a home cooked meal prepared by the Jackson County Master Gardeners. The lunch featured squash from farmer Allen Childs in Sneads, FL and peas from J&J Produce in Cottondale, FL. The lunch was capped off by ice cream from Southern Craft Creamery in Marianna, FL. Snack breaks included chocolate milk from the Ocheesee Creamery in Blountstown, FL. Keynote Speaker Richard Wiswall (Cate Farm, East Montpelier, VT) talked to participants about building a farm business. Photo Credit: Doug Mayo, UF/IFAS Extension. 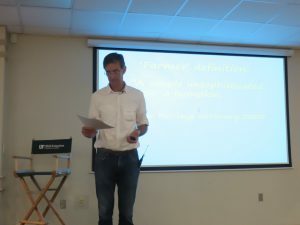 To kick off the afternoon events, Farmer Richard Wiswall from Cate Farm in East Montpelier, VT talked to participants about managing a successful farm enterprises. He shared his experiences about starting with a small farm and growing over time as finances allowed. Richard also led a farm business seminar in the afternoon. Mack Glass welcomes Citrus Tour participants to Cherokee Satsuma’s packing house. Photo Credit: Doug Mayo, UF/IFAS Extension. 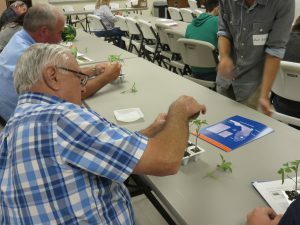 Attendees had to make a difficult decision when choosing between an afternoon tour, a farm business discussion, or a hands-on vegetable grafting demonstration. 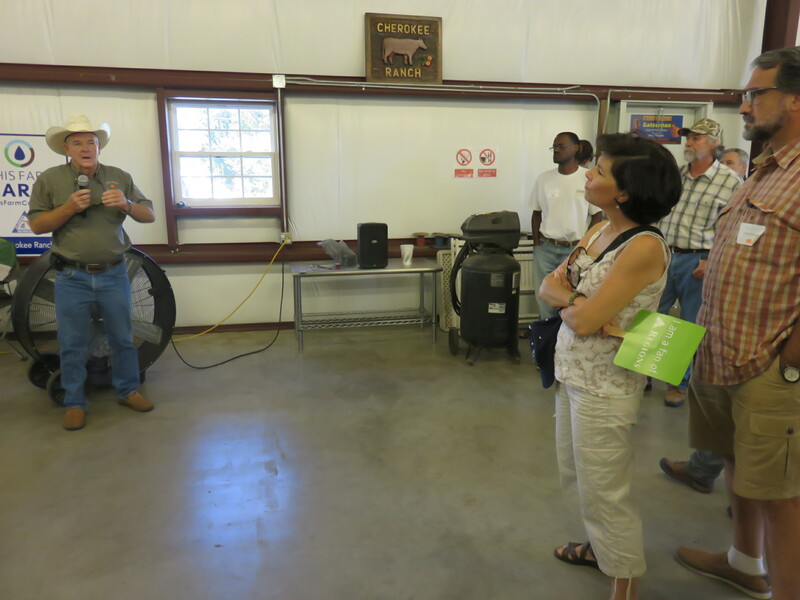 Participants on the Citrus Tour got to see Mack Glass’ packing house and his satsuma grove south of Marianna. Grafting tomato transplants at the Panhandle Fruit & Vegetable Conference. Photo Credit: Doug Mayo, UF/IFAS Extension. UF Grafting Specialist, Dr. Xin Zhao, came in town to teach participants how to graft vegetables. 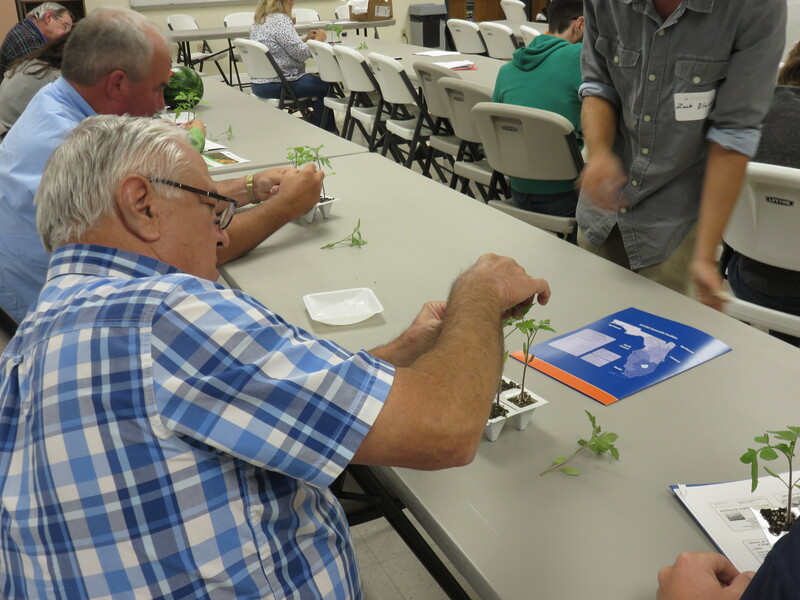 Participants got to practice grafting tomato plants. 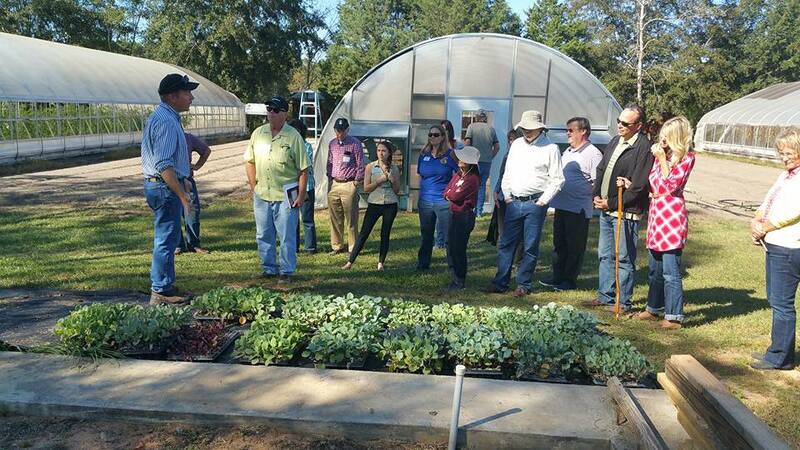 Participants of the Protected Agriculture Tour visited Fox Family Farm in Cottondale, FL. Photo Credit: Libbie Johnson, UF/IFAS Extension. 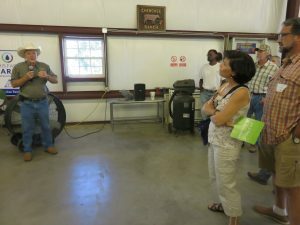 The Protected Agriculture Tour visited Fox Family Farm in Cottondale. Fox Family Farm utilizes high tunnels to grow heirloom tomatoes and other vegetables. They are a Certified USDA Organic Farm. 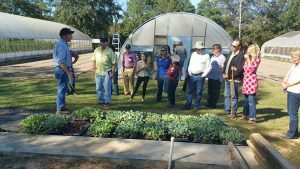 The Panhandle Fruit & Vegetable Conference was a success thanks to the volunteers, sponsors, and Extension Agents and Specialists that made it all possible. We are looking forward to the next Panhandle Fruit & Vegetable Conference.